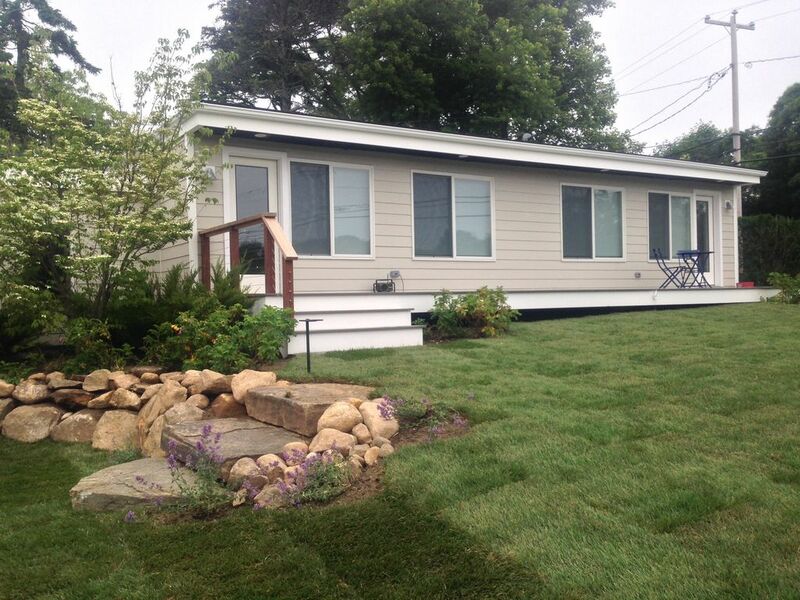 Recently renovated, this unit we call Navy Beach provides a relaxing retreat on Lake Montauk. Navy Beach comes equipped with a full kitchen, washer/dryer, linens, towels, large screen TVs, air conditioning throughout bedroom and living room area, access to private lake beach as well as kayaks and paddle boards to enjoy a summer on the water! Dine outside on outdoor deck space complete with gas grill and seating. Guests can enjoy a common seating area and fire pit near the lake. Please note that there is a grass path from the parking spot to the deck and one step up to the deck. Please note: We do NOT advertise on Craigslist. Any representation there of this listing is a fraud. Duffy's on Lake Montauk is situated on lovely Lake Montauk. Enjoy paddling and kayaking on the lake during the day and savor summer sunsets in the evening. A welcome note from hosts Rick and Kelly explains wifi passwords and TV and music set up, as well as additional information to make your stay comfortable. The cottages come equipped with a blender, toaster, coffee maker, grill tools, hair dryer, iron, ironing board, two beach towels and a small cooler. The kitchen is stocked with plates, bowls, glasses, cups, wine glasses, utensils, tupperware, pots and pans, cutting boards, can opener, corkscrew, pitcher and outdoor dining plates and utensils. Salt and pepper and spices are provided. Renters will find a small shampoo and soap in the bathroom and dish soap and laundry detergent in the kitchen for their use. As the cottages are self catering, they are thoroughly cleaned before your arrival and after your departure. Additional cleaning during extended stays may be arranged through a cleaning service. We look forward to having you. Navy Beach was perfect! It was super clean and decor was adorable. Perfect size for 2 people. Kitchen had all the amenities you could want or need. The location is perfect, too. 5-10 minutes from anywhere you’d want to be in Montauk. Definitely would stay here again/recommend to friends! This rental was absolutely perfect for us. We were in Montauk for a wedding and only wish we could have taken advantage of all that Kelly and Rick's place had to offer. It's decorated beautifully and comfortably and, most importantly, it is immaculately clean and it's clear our hosts care about their property and their guests. Thank you for a great weekend! It was perfect! Kelly thought of everything. Newly decorated, it is at a beautiful location. Dishwasher, Washer/Dryer, huge shower, towels, a zillion pillows, clean and easy to keep clean. It is the perfect get away near everything in Montauk. We really enjoyed our stay. Cozy, quiet, clean and central - perfect home base for a long weekend in Montauk! The Relaxing Lake Retreat had it all for our long off-season weekend in Montauk: steps away from awesome lake views, clean and modern furnishings, a short bike ride to town and the lighthouse, and it was nice and quiet. K was super helpful with recommendations and even stopped by to welcome us and make sure we had everything we needed. We would definitely love to come back! Initially I had a few apprehensions about staying at an airbnb but this place quickly removed all apprehensions. The place is EXACTLY as advertised and Kelly and Rick are THE NICEST people. We had a situation where our remote control wasn't working and at 10pm Rick came and brought us new batteries and a new remote! The attention to detail here is impeccable. Literally everything you would need is provided. The place is beautiful, convenient and close to everything. Honestly I have no complaints at all. When we come back to Montauk we will only stay at Kelly n Rick' s location, they're awesome! What an amazing spot!! Set on Lake Montauk this property provided all we needed for a relaxing vacation. The property was charming, immaculate and provided all the necessary amenities. Just a few miles from downtown Montauk and a bike ride to Montauk Lighthouse, the location was perfect. It was peaceful and we enjoyed the amazing sunsets while we roasted marshmallows around the fire pit. The owners were very attentive and provided paddleboards and kayaks as well! What a great way to close out the summer! Can't wait to come back! The property is located between Gin Beach and Ditch Plains. Ride your bike to either beach or a short drive will take you to town or the dock area. Excellent restaurants abound. Enjoy leisurely days or evenings sitting by the lake or relaxing on the private beach. Rates are subject to change until reservation is confirmed. Smoking, pets and air mattresses are not allowed. Minimum age of renters is 25.